We pay you back in rewards! Your everyday purchases have never been more rewarding! TwinStar Rewards is a simple, easy to use program that rewards you with points each time you use your TwinStar Platinum Rewards Visa card. From groceries to fuel to utility bills, your everyday purchases will really pay off. With our Ampre card-linked offers: Shop our exclusive network of local and national merchants and earn bonus points. Ampre works by automatically linking offers directly to your rewards card. Simply use your rewards card at participating merchants and earn! At our Perks Points Mall: Shop our online network of over 800 top national and regional merchants and earn 5x points. 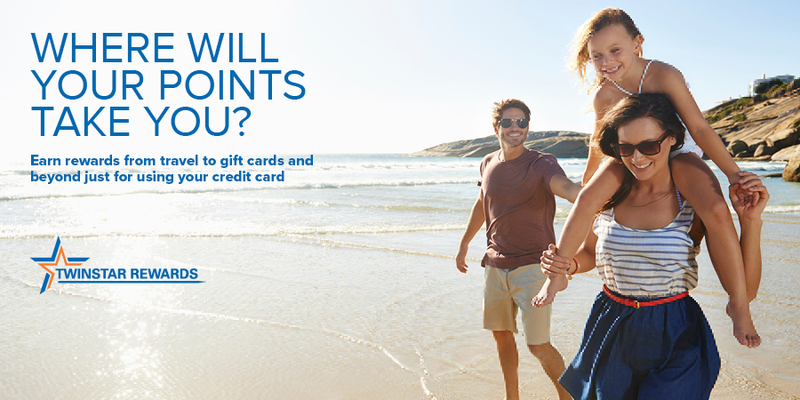 At our More Points Superstore: Earn 3x points on all qualified purchases including brand name merchandise and popular gift cards for dining, entertainment, shopping and travel related expenses including hotel, fuel and car rental.